Oxford University Press, USA, 9780199232581, 663pp. This invaluable reference work offers the best advice on English usage, drawing on the unrivalled resources of Oxford's English Dictionaries program and language monitoring. This second edition of the "Pocket Fowler" harks back to the original 1926 edition of A Dictionary of Modern English Usage by Henry Fowler, widely regarded as the finest such guide in print. Updated with the use of the Oxford English Corpus, a database of over two billion words, and with up-to-date entries on the language of emails and the Internet, the new edition answers your most frequently asked questions about language use. Should you use a split infinitive or a preposition at the end of a sentence? Is it "infer" or "imply"? "Who" or "whom"? What are the main differences between British and American English? Over 4,000 entries offer clear recommendations on issues of grammar, pronunciation, spelling, confusable words, and written style. Real examples are drawn from classic and contemporary literary sources, newspapers and magazines, and the Internet. 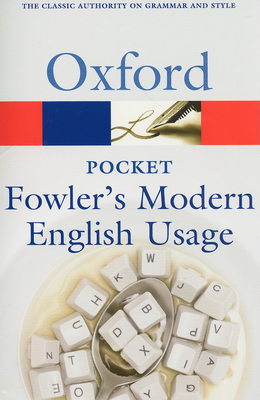 Pocket Fowler's Modern English Usage, Second Edition is an indispensable companion for anyone who wants to use the English language effectively. Robert Allen is an experienced lexicographer and writer on a wide range of language issues. A former Senior Editor of the Oxford English Dictionary, he was Chief Editor of the eighth edition of the Concise Oxford Dictionary and an Associate Editor of the Oxford Companion to the English Language.